Previously, the concept of having a projector makes the person think of a big thing that not all can have. However, the advancements in the technology and the need of convenience of mankind start to decrease the size of the objects including projectors. With the start of the New Year, we now have portable projectors that can be as useful and functional as the previous ones, but much more convenient to carry and to fit in a pocket. I am talking about the Projector Cases that can help you to project your documents, movies, pictures, videos or anything you want, but with the enhanced brightness, seamless contrast and with portability as well. So, if you are looking for such thing to connect your iPhone 7 with, then you need not to miss this. In order to enjoy a movie on a big screen that you have on your iPhone 7, all you need is to have is to adjust Lights, DAEON Portable Video Projector for iPhone 7 and Action. With this amazing portable projector case, teaching, sharing and working have been easy and convenient. You can enjoy your freedom along with your favorite media, wither you are in car, in tents, in meeting, in a hollow room or in camping. Well, this need not to be mentioned, however, as one of the plus, the projector case that I am reviewing is highly portable. That means the fun need not to be stopped anywhere and anytime. To share your phone’s screen, all you need is to put this portable projector case on your phone and you are done with anything you want to enjoy on big screen. If you want to enjoy more color, high contrast, realistic and beautiful enlarged image, without pixels to be broken, this thing is best for you. Not only the larger image, you will also get the image quality with this amazing portable projector. DAEON(TM) Portable Video Projector for iPhone 7 offers native 854×480 Pixels and 2000:1 contrasting option that would definitely enhance your projecting experience. This one needs to be mentioned. 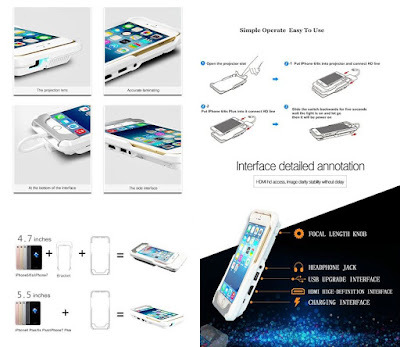 The projector case can also act as a smooth power bank for your device, when you are in battery lack condition. As the case is equipped with 2400mAh battery, you can find this case very useful in starving situations. Of course, this thing can work well with your iPhone 7. But only with iPhone 7 / Plus, this projector case is compatible with most of the iOS devices including iPhone 5/5s and iPhone 6/6s as well. With all the above mentioned features, the look of your phone is not at all compromised. The projector case is designed with a great sleek and stylish design that will go best with your iPhone 7, without interfering with its seamless exterior. A decent source of projecting videos, movies, pictures, games etc. Using DAEON Portable Video Projector on your iPhone 7 is a piece of cake. All you need is to have Apple lightning digital AV Adapter. Open the Projector slot and out your phone into the projector and connect HD line. Slide the switch backwards for few seconds and let the light to switch on. After that, it will power up and you can enjoy your home theatre using this portable projector case. For all the iPhone 7 users, this is the portable projector for you. The thing is feature rich with few drawbacks that will surely be masked with its amazing pros and value.